← Maybe The Next Pope Will…. Currently my shock has given way to excitement to find out who our next Pope will be. 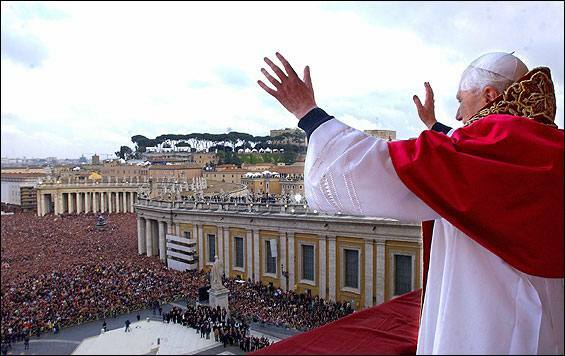 I remember the first conclave of my life that elected Pope Benedict, and watching his first words as Pope to the crowd in St. Peter’s Square on the TV outside the Loft Store in the ground floor of the Pryzbyla Center at Catholic University. I was a Junior in College, its been a while. I remember his first words went something like this, to a multitude of cheers, “I am a humble worker in the vineyard of our Lord.” I remember shedding tears of joy at the fact that Giuseppe Cardinale Ratzinger had been elected Pope! After all the hype centered around the Papabile I remember being totally and wonderfully surprised at the Conclave’s choice. Will I be equally pleased with the choice of the next Pope, or perhaps even more overjoyed? Who knows? But the main point is that God is in control. He is guiding the Church and through the power of the Holy Spirit he is bringing Christ to life in the womb, the heart of Mother Church, just as He brought Christ to life in Mary’s womb at the Annunciation! Do not be afraid! When God the Father guides the Church into deep water, an immense catch, more than we can count and more than our nets can handle, is in his plans for us! This entry was posted in Post Conciliar Church and tagged Annunciation, Christ, Church, God, Jesus, Mary, Pope, Rome. Bookmark the permalink.